29 ""Introduction to Black feminism"
Ash-Lee Woodard Henderson is a Chattanooga Tennessee activist. She has been active in the Chattanooga People's Platform, a coalition to raise demands of marginalized members of the Chattanooga community. She is also a member of Chattanooga’s Greater Tucker Missionary Baptist Church. Her parents are Tamara Woodard of Ooltewah and Rev. LeRoy Henderson, Jr. of Valdosta, Ga., and she is engaged to Jared Story, son of Jerry Story and Nancy Story of Jonesborough. In 2014, she was working as a Regional Organizer at Project South, Atlanta Georgia. She is also an active participant in the Movement for Black Lives. 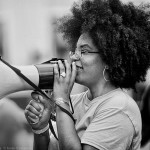 Ash-Lee Henderson comes to Highlander Research and Education Center from Project South, where she is a member and regional organizer, active participant on the governance council of the Southern Movement Assembly, and organizer with Concerned Citizens for Justice (Chattanooga, TN). Henderson's mother was born and raised in Summit (a tight knit community near Ooltewah and Collegedale), so she had the opportunity to experience the urban lifestyles of Chattanooga and the more rural culture of the county. Most of her time in K-12 was in Ooltewah. She attended the elementary, intermediate, middle and high schools, with a brief stint at Chattanooga Christian, and graduated from the first graduating class at Hamilton County High. Henderson names as inspirational women she has known - mother, Tamara Woodard, who has fought for freedom and justice for all people for decades in Chattanooga and elsewhere. Maxine Cousin who has demanded justice for thirty years since her father, Wadie Suttles, died in police custody in Chattanooga. The women leaders and organizers of Concerned Citizens for Justice, Black Workers for Justice, United Campus Workers, Project South, the Environmental Justice Movement, Student and Labor Movements, Highlander Research and Education Center, and her church Greater Tucker Missionary Baptist. Some of those names are Jamala Rogers, Rukia Lumumba, Maria Gunoe, Carol Judy, Vickie Terry, Tanya Turner, and Bernice Johnson Reagon. Ash-Lee Henderson describes herself as an Affrilachian (Black Appalachian), working class womyn, born and raised in Southeast Tennessee. Ash-Lee Woodard Henderson attended East Tennessee State University, majoring in English and minoring in African and African American Studies. She has served in positions of leadership for many organization including being the former Organizational Liaison for the Initiative for Clean Energy at ETSU, former vice-president of the Feminist Majority Leadership Alliance, past president of the Black Affairs Association and the Rho Upsilon Chapter of Delta Sigma Theta Sorority, Inc.
She is a past student representative on the ETSU Race Relations Dialogue Taskforce and the President’s Council on Cultural Diversity, the ETSU Sustainability Committee and served on the Planning Committee as a student site leader for ETSU’s Alternative Spring Break Program. Ash-Lee has also been an active member of LGBTieS, the Alpha Theta Chapter of Iota Iota Iota (Tri-Iota), and is a co-founder of the Progressive Student Alliance at ETSU. Ash-Lee Woodard Henderson is an immediate-past member of the United Students Against Sweatshops national Coordinating and Collective Liberation Committees. Additionally she is a long time activist working around issues of community empowerment, environmental destruction, mountaintop removal mining, and environmental racism in Central and Southern Appalachia, and serves on the Student Environmental Action Coalition’s National Council. Endorsers for the Congress included Ash-Lee Henderson ETSU Black Affairs Association. United Students Against Sweatshops Coordinating Committee, 2009-2010 School Year. Holding a public option sign behind Phil Roe during his on camera interview. — with Thomas Wayne Walker, Jared Story, Ash-Lee Henderson, Axl Van Der Munj and Veronica Limeberry. On January 22, 2010 UMD is hosting a benefit concert to help raise money on behalf two Tennessee activists, Ash-Lee Henderson and Jared story, who put their freedom on the line in an act of non-violent civil disobedience to defend the mountains of Appalachia. These brave individuals walked onto Kayford Mountain in West Virginia along with 6 other activists and stopped the mountain from being blasted. Six of the “Kayford 8” protestors locked themselves, in groups of three, to a piece of massive earth moving equipment–referred to as a Yuke–with tires 24′ tall and hung a banner reading “Never Again” on the machine. This action was part of a fierce campaign that is being waged in southern West Virginia against companies destroying the Appalachian Mountains with mountaintop removal. Their actions were not without consequences and they are now facing the maximum fines for trespassing of nearly $2000 each which is unprecedented in this type of protest. They took a risk for the greater good and we hope you will be willing to support them for doing so. The eight activists arrested include Kim Kirkbride, Ash-Lee Henderson, Tanya Turner, Jared Story, Willie Dodson, Will Wickham, Mathew Louis-Rosenberg, and Glenn Collins. March 2011, U of M students Justin Sledge, philosophy graduate student, and Sally Joyner, U of M law student, were among the seven protesters released from jail on bond Tuesday night following their arrests at a Nashville protest at the state capitol. The two students, as well as Paul Garner and Leah Shoaf, students at Memphis College of Art, Jeffrey Lichtenstein and Bennett Foster, Memphians, and Ash-Lee Henderson of Chattanooga, were charged with disorderly conduct and resisting arrest. The incident has drawn polarized reactions from across the state, with some applauding the efforts of the protesters and others condemning their behavior, including elected officials. Thursday, state senator Randy McNally said he was "dismayed" when he learned that some of the arrestees were members of The U of M's registered student organization Progressive Student Alliance, calling for disciplinary action from The University. Sledge is the vice president of The U of M chapter of Progressive Student Alliance, which helped organize the rally with unions and labor groups from across Tennessee. Lichtenstein, though not a U of M student, is also a member of the group. PSA issued a statement Thursday night addressing its role in the protest and the seven "unjustly" arrested Tennesseans, lauding the "scores of people who stood against empty rhetoric and for real democracy" during the protest. The group said the actions of protestors during Tuesday's Senate committee meeting, for which Tennessee state troopers forcibly removed them, were not organized or planned in advance. "If Nashville politicians spent as much time listening to the demands of workers and students as they do slandering PSA in the press, our democracy would be in better shape, and we could find more productive things to be doing on a Thursday night than writing press releases." Lichtenstein and Sledge declined to comment individually on the incident. Matthew Meiner, state treasurer of Tennessee Intercollegiate State Legislature and student at Vanderbilt University, was at the hearing when the protesters began shouting down legislators and refusing to leave. "I understand their position, and I respect the right to protest, but it was kind of disappointing to see them disrupt the system," he said. "They made their points, but there are more orderly ways to do it." Six of the people James Sledge, 30, Jeffrey Lichtenstein, 25, Paul Garner, 22, Bennett Foster, 25, Leah Shoaf, 19 and Sally Joyner, 26 were with the Progressive Student Alliance at The University of Memphis. Ash-Lee Henderson, 25, is from Chattanooga and an organization called Chattanooga Organized for Action. 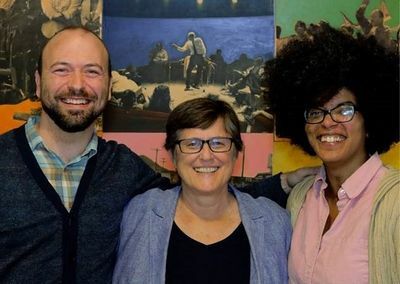 Henderson has extensive knowledge of the use of community organizing and is a former staff member of the Chicago SNCC (Student Nonviolent Coordinating Committee) History Project. She is a past member of the united Students Against Sweatshops National Coordinating, Political Education and Collective Liberation Committees. Henderson has served on the board of directors/coordinating committees/core leadership of United Students Against Sweatshops, the Student Environmental Action Coalition, the Highlander Research and Education Center, and Concerned Citizens for Justice of Chattanooga, among others. She has been arrested twice and cited once in protests to end mountaintop removal coal mining and coal related disasters and to protect workers rights to organize. She has organized in the movement to end racial oppression, the feminist/womanist movement, the environmental justice movement, the LGBTQUI movement, and more. In 2014 Henderson was supporting the campaign of Chokwe Lumumba for mayor of Jackson, Mississippi because he plans to implement a platform created by and for the people. She was encouraging people to attend the Jackson Rising: New Economies Conference designed to bring about an economy that works for all people in Jackson. In Chattanooga she was supporting the ongoing work to win the demands in the Chattanooga People's Platform and organizing with Concerned Citizens for Justice, who is organizing to “Ban the Box” on employment applications that makes it nearly impossible for formerly incarcerated people to get jobs, and working with leaders in Jackson, Mississippi, and Memphis, Tennessee, to start a “Fresh Start” or “Second Chances” program in Chattanooga that would decrease recidivism rates. Ash-Lee Henderson served on the Board of Directors for and organized with Chattanooga Organized for Action. "False Solutions, such as "Clean Coal," harm communities on the front lines of extraction". This event took place at CARECEN in Los Angeles, featuring Tom Goldtooth, Indigenous Environmental Network (IEN), Ash-Lee Henderson, Mountain Justice, and Bill Gallegos (Communities for a Better Environment). Hosted by Cindy Wiesner (Grassroots Global Justice Alliance - and Tammy Bang Luu (The Strategy Center). Second Panel: Sunyoung Yang, and others on community-based real solutions. There was a very successful Southern region Committees of Correspondence for Democracy and Socialism workshop at the 2010 Social Forum in Detroit—about twelve individuals came to the panel. Bill Chandler, Ash-Lee Henderson, Brandon Wallace, and Tim Johnson were presenters. Click the link http://bit.ly/HGjG0P Email the Federal Transit Administration and call on them to mandate LA Metro to give us back our million hours of bus service. Reshare! — with Haewon Asfaw, Manuel Criollo, Nicole Eng, Emilie Blattman Costello, Patrisse Cullors, Steggie Hufstedler, Emory Douglas, Cynthia Azali-Rojas, Alejandra Lemus, Francesca Contreras, Dae-Han Song, Jas Wade, Kitzia Esteva, Ashley Franklin, Chantal Coudoux, Rebecca Eleanor, Raquel Romao, Damon Gbuduala Azali-Rojas, John Bell, Snad Garrett, Tammy Bang Luu, Carla Gonzalez, Kelly Archbold, Tekoah B. Flory, Frankie Darling Palacios, Ron Gochez, Simone Andrews, Crystal McMillan, Nati C. Poder, Ami Patel, Kalil Cohen, Sunyoung Yang, Ash-Lee Henderson and Bus Riders Union. 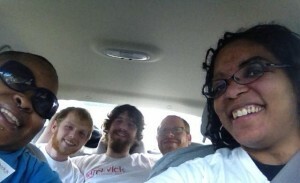 Ash-Lee Henderson, Cazembe Jackson, Mark Gilliland, Josh Smyser, Jared Story participated in a Freedom Road Socialist Organization delegation to Jackson, Mississippi to support the Chokwe Lumumba campaign during the Democratic Primary in May 2013. Both members and friends of Freedom Road participated in canvassing, poll-watching, sign holding and other activities to support Chokwe Lumumba and Joyce Hardwick, the two candidates recruited to run on the People’s Assemblies platform. Ash-Lee: I think the first time I heard about the Lumumba campaign was when members of People’s Durham told me about the campaign and invited folks from Tennessee to join them on their Black Belt Summer trip in June 2012. The Black Belt Summer trip included a stop in Jackson to learn about the People’s Assembly and do some ground work for the Lumumba campaign. I was not able to go along on that trip, but when the opportunity presented itself to go and help out the campaign during the Democratic primary, it was the People’s Assembly model and platform—the embodiment of direct democracy and self-determination—that made me feel I couldn’t pass up the opportunity. I believe strongly that we must Organize the South and show solidarity between the Southern States. I understood that the campaign would be attacked from the right and from white supremacists with access to lots of money, so I wanted to be one in the number and bring other folks with me to support the campaign. I knew it would take a lot of folks on the ground doing canvassing, poll-watching, and sign holding, among other things to fight back against those attacks and the massive amounts of money from the opposition. I was able to bring 3-4 other folks with me from Chattanooga to work during the Democratic primary, the primary runoff, and the general election. We kept going back because the people kept winning and because of the relationships we built with the grassroots folks working on the campaign day to day. Ash-Lee: I have family in Kilmichael, MS, and I have been going to Mississippi and organizing since 2004 when I participated in the Freedom Ride for Justice, a 3 week voter registration and education drive focused on getting young voters registered for the 2004 presidential election and raising awareness about the lack of justice in the Chaney, Goodman, and Schwerner case—the three civil rights workers murdered in Neshoba County, MS during 1964’s Mississippi Summer Project. For a couple of years, I helped organize the Annual Mississippi Civil Rights Martyrs Memorial Service and Caravan for Justice. At the 2013 Committees of Correspondence for Democracy and Socialism conference, the third and last plenary session on Friday was on climate change. Chaired by Marian Gordon of Los Angeles, the presenters were Zach Robinson of North Carolina, and Ash-Lee Henderson of Tennessee. Mark Gilliland February , 2013 with Petro On, Jared Story, Ash-Lee Henderson, Mark Ortiz, Francisco Rios, Melissa Godfrizzle, Keavy McFadden, Stephen Agwu, Bianca Hinz Foley, Jan Van Tol, Vee Ramesses, Claire Lewis, Billy Yates, AK Kulkarni, Terasia Carin Bradford, Maria Antonia Rodriguez, Lingran Kong, Leewana Thomas, Sol Gonz, Javier Figueroa, Alli Sehon, Brock Meade, Benji Ng, Jeffrey Lichtenstein, Melissa Horsfall, John Gieryn, Rigoberto Campos, Martin Xavi Macias, Carmen Armen, Kayla Frye, Kathleen Brower, Casey Sweeney and Sara Neumann at United Students Against Sweatshops 16th Annual National Conference in Miami! Highlander Research and Education Center, and Rural Support Partners, organized an Appalachian Transition Fellowship event in Chattanooga, November 12, 2013. TOMORROW! Be there! #spreadtheword — with Dominique Pennington, Miles Dougherty, Napoleon Williams, Karl Epperson, Patrick Kellogg, Baris Gursakal, Patricia Bazemore, Michael L. Feely, Shelley L. King, Jr., Michael Kelly, Dennis Milton Clark, Tenesha M. Irvin, Madeleine Dougherty, Angela Sweet, Brett Pike, Jason Hurd, Dwight Harrison, Rachel Rudi, Laurie Perry Vaughen, Willie McClendon, Rushelle Frazier, Terry Davis, Ann Law, Marcus Patrick Ellsworth, Beth Foster, Fr. Michael Cummins, Mark Gilliland, Jared Story, Cazembe Jackson, Valerie Radu, Landon Willaim Howard, Patricia Combs, Rebekah Mawuko, Taurus Hinton and Annika Hampton. Four people were arrested October 22, 2014, while protesting street violence and police brutality at the intersection of Main Street and Market Street in Chattanooga. About a dozen protesters were marching with Concerned Citizens for Justice as part of a national day of protests and were arrested when they entered the intersection and blocked traffic, the group said on its Facebook page. Ash-Lee Henderson, 29, Janelle Jackson, 34, Michael Heath, 22, and Madison Dillard, 20, were all arrested and charged with inciting to riot and obstructing a highway. Jackson was also charged with resisting arrest. 1st anniversary of Akai Gurley Killed By Police — with Bill Breidenstein, Alicia Garza, Shirley Henry Jenkins, Stevan Kirschbaum, Osagyefo Sekou, Marshata Caradine, Shay Ase Dune, Ash-Lee Henderson, Cat Brooks, Faye Venetia Harrison, Justice For Akai Gurley Family and Justice for Akai Gurley. JusticeForTanishaAnderson — with Elisa J. Cook, Camilla Freitag, Sumumba Sobukwe, Beechie X. Keeton, Howard Rotman, Gregg L. Greer, Faye Venetia Harrison, Osagyefo Sekou, Jasmine Johnson, Frank Lara, Alicia Garza and Rob Rogers. Karl Kumodzi, Mervyn Marcano, Thenjiwe Tameika McHarris, Montague Simmons, Zakiya Scott, Maurice Moe Mitchell, Dara Cooper, Ash-Lee Henderson, Morathi Adams and Marbre Stahly-Butts, Facebook, August 1, 2016. When Cazembe Jackson became the new National Organizer for Freedom Road Socialist Organization in July 2016, Ash-Lee Henderson was supportive, on his Facebook page. Those indicating interest in attending, on Facebook included Ash-Lee Henderson. In December 2016, the Board of Directors and staff were pleased to announce that Ash-Lee Henderson and Rev. Allyn Maxfield-Steele will serve as Highlander Research and Education Center’s Co-Executive Directors. Following Pam McMichael’s decision to transition out of the ED role after twelve years of dedicated and remarkable service, Highlander established a Transition Team of three board members and two staff to guide the ED search process. Ash-Lee received encouragement from movement friends and mentors to apply for the position, after which she invited Allyn to apply with her as co-directors. Their proposal captured the imagination of the Transition Team and was well received by both board and staff. As sitting board members, Ash and Allyn recused themselves from all parts of the selection process following their application. At the November Board meeting, they underwent an extensive interview process with the Board and staff. As of this week, Ash and Allyn have begun the transition process alongside outgoing Executive Director Pam McMichael and staff, and they will assume full-time responsibilities in February 2017. Those expressing interest on Facebook included Ash-Lee Henderson.